Philip Burke King's interests and methods of scientific inquiry were those of a field geologist who obtains his data from the rocks exposed at the Earth's surface and from them derives inferences as to the history and behavior of the Earth. He was especially interested in the sedimentary rocks, and interpreted the environments in which they were originally laid down and the relation of these environments to tectonic movements that were taking place in the Earth's crust. King was graduated from Iowa State University (B.A., 1924; M.S., 1927) and Yale University (Ph.D., 1929). 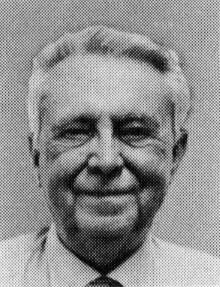 He spent most of his career from 1930 onward as a geologist with the U.S. Geological Survey. He taught at universities for short periods: (Texas, 1925-27), Arizona (1929-30), UCLA (1954-56), and in the autumn of 1965 was a visiting lecturer at the University of Moscow. In 1965, he was awarded the Penrose Medal of the Geological Society of America and the Distinguished Service Medal of the U.S. Department of Interior. He was elected to the American Academy of Arts and Sciences in 1966. He was attending the International Geological Congress meeting in Prague in August, 1968, when the Soviets invaded; he was evacuated to Nuernberg. King did his early field work (1925) in the Marathon region, an area of about 1,600 square miles in the trans-Pecos part of Texas, where varied rocks and structures that were formed during the Paleozoic have been stripped of the cover of younger strata that conceal them elsewhere in this part of the Southwest. His first field work in the Marathon region was on Permian marine strata that form a sequence about 7,000 feet thick on the northern side of the Glass Mountains. Instead of an orderly sequence, the strata of the Glass Mountains were a disorderly array of discontinuous bodies of carbonate rocks, shale, and sandstone. An opportunity to clarify the Permian stratigraphy of western Texas came later (1934), when King began work in the southern Guadalupe Mountains about 150 miles northwest of the Glass Mountains. During King's field work there, he gave much attention to the Capitan Limestone, which stands in lofty white cliffs at the summit of the mountains. In 1940-44, the wartime search for strategic minerals by the U.S. Geological Survey afforded King an opportunity to investigate the Appalachian Mountains in Virginia and Tennessee where he unraveled and interpreted the massive folds and low-angle thrusts of that region. As he did these earlier investigations, he was aware of their broader significance and developed regional syntheses that resulted in his publications Evolution of North America (1959), the Tectonic Map of the United States (1944; 2nd ed. 1962; National Atlas version 1989), and the compilation of the Tectonic Map of North America (1969). 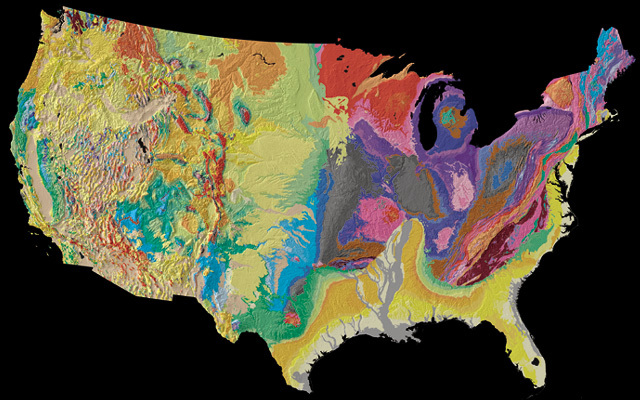 In 1974, he and Helen Beikman produced the Geologic Map of the United States (see graphic near the top of this Web page). King and Beikman's work lives on into the digital age. Their map has now been re-released, complete with ArcInfo coverages, as U.S. Geological Survey Digital Data Series DDS-11, Release 2 ( http://minerals.usgs.gov/kb/) (Schruben and others, 1998). This map was combined by José F. Vigil, Richard J. Pike, and David G. Howell in 2000, with the digital shaded-relief image created by Thelin and Pike in 1991, to create A Tapestry of Time and Terrain ( http://tapestry.usgs.gov/ and http://geopubs.wr.usgs.gov/i-map/i2720/) (Vigil and others, 2000). Philip B. King passed away on April 25, 1987. Trudy Myrrh, Phil's daughter, kindly lent us the original of the typewritten manuscript. Kurt Servos inspired the project. Mary Jane Coombs scanned Phil's original typewriter pages and combined the results into a Portable Document Format (PDF) file. Henry C. Berg reviewed the document for spelling and typographical errors. Michael Diggles made corrections, added bookmarks, thumbnails, and a hot-linked table of contents, and created an optical-character-recognition (OCR) hidden layer (to allow word searches) and an html front end. King, P.B., 1959, The evolution of North America: Princeton, N.J., Princeton University Press, . 189 p.
King, P.B., 1989, Tectonic maps of the United States, in National atlas of the United States: Reston, Va., U.S. Geological Survey, 2 sheets, scale 1:7,500,000. King, P.B., and Beikman, H.M., compilers, 1974, Geologic map of the United States (exclusive of Alaska and Hawaii): Reston, Va., U.S. Geological Survey, three sheets, scale 1:2,500,000. Schruben, P.G., Arndt, R.E., and Bawiek, W.J. compilers, display software by Russell A. Ambroziak, R.A., 1998, Geology of the conterminous United States at 1:2,500,000 scale - a digital representation of the 1974 P.B. King and H.M. Beikman Map: U.S. Geological Survey Digital Data Series DDS-11, Release 2 (CD-ROM). Thelin, G.P., and Pike, R.J., 1991, Landforms of the conterminous United States - a digital shaded-relief portrayal: U.S. Geological Survey Miscellaneous Investigations Series Map I-2206. Vigil, J.F., Pike, R.J., and Howell, D.G., 2000, A Tapestry of Time and Terrain: U.S. Geological Survey Miscellaneous Investigations Series Map I 2720. To view PDF publications on this Web server, you will need Adobe Reader. The autobiography provided here is in PDF format. The file has thumbnails and will open with bookmarks to each of the headings. The OCR work translated words on the scanned pages to ASCII for over 90 percent of the manuscript. For these words, the "Find" feature in Acrobat Reader will work. Click the link below to view the report in PDF format.